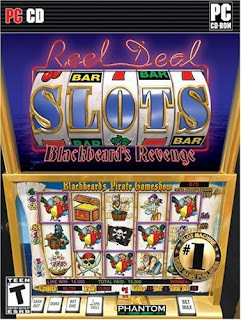 Comfortably located on a ship with a beautiful view on the side, Reel Deal Blackbeard's Revenge offers 3 different casinos for me to wander through the night! 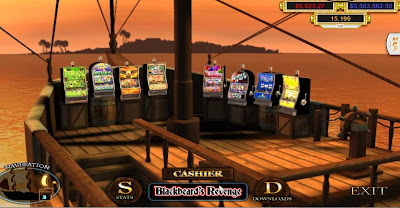 With a wide range of bonus games, festive graphics and sounds, I can easily spend hours browsing through the many different fun slots calling out to me on this cool ship! Despite it being just a game with no real payout, I do love the adrenaline rush I get every time I hear the cling clang of coins flooding out of a slot machine whenever I WIN the jackpot on one of my slots! The graphics of this PC game are simply superb as well, making me feel as though I'm in a real casino LOL! Plus, I'm already making almost 5 million bucks in virtual dollars, so what's not to like? Morning Monica! You're up early! Me off to zzzzz in a bit, so I'll see u in a few hours! Monica...did you change your pic? Congrats on being the first to comment. I hope you have a good night's sleep. Or should I say a good day nap? Then head on over to Vegas lady. You would have much fun in Las Vegas. Hahaha.. Ch'ching!! A sudden rush of images came to mind.. South Bank, Pizza, Crown..
though there is no star on this post, i am still going to congratulate you for being the 1st..
Grandy, marzie had an early sleep last nite, but i am not sure what time did she wake up this morning..
Marzie, hope u dapat itu slot yang akhirnya bunyi..
Wah, you into casinos now huh? LOL! wah syiok gitu main game!! i cannot start, if i start, semua kerja tak jadi!! i'll be addicted like crazy! crazy la budak yang bernama rizal tu!!! Dah top tu!!! Uwaa! payah nak kejar ni! Oooo semalaman kerjanya mengomen ye rizal. bono, you must komen and komen to be in the list! Rizal, bestlah bunyi kaching kaching tu! nanti dah kaching kaching boleh beli bling bling! Zeffer, ch'ching lagi halus bunyinya! sorrym now it's afternoon, so good afternoon everybody! Guten tag! Hi Emila... I see you and Rizal are both commenting away. Did you have a great Birthday, beautiful?? Rizal~ I hope your flu (or whatever you are fighting) is getting better. Hello to all you Mariucans!! I didn't realize you had top commenters too, Emila. Marzie has like...a gazillion...so I don't have much hope there. Although I am pleased to be in your top 20. I feel so honored that you all have accepted me in your little community. Mazie I think you have to add Twitter logo so that many people will follow you. Grandy, thank you! I celebrated my birthday just like any other ordinary day! but yesterday was extra ordinary as my son was extra naughty and I had extra laundries to wash! haha! Grandy, come and join the top commenter at my blog. This month's prize is a handpainted mug! As for November, I am giving away new prizes!! Hehe Marzie is determined to win the mug because she has won the other mug; it came in as a pair. yay bono! you go bono! haazig, takpe pergilah rest sekejap nanti bangun baru mengomen! I so wanna go to Vegas Grandy, anybody wants to sponsor me a trip to Vegas??? Good morning Rizal, or should I say afternoon now? Thanks for wishing all Mariucans here as well ha ha! I love the one in the pink dress too Mariuca! but recently there's a reader sent me a 'sicko' email saying..hmmm...you know..
Wah, those are expensive! I don't think I'll be able to afford those, ever! :) I bet the result is great, no? Expense kan?? Dat's why must use for special okasi only! Debbs, wan to ask, ur Zenni post dah lulus ke? Zenni? Not yet la Marzie. My Webhosting also not yet. Yours? They take a long time to approve, right? :) But the money is not too bad. GP!!! You're on a roll!!!! I've sent you the code already dearie! My Mr Nice Guy log off suddenly last night at midnight and offline till now..
GP Not sure if you reply to my boldie remark.. i had to delete all the comments on emails to make way for urgent email..hehe.. sorry ah.. OMG!!!! 9 comments only from me??!! Aiyohhh!!! Still figuring out how to clear comments at the beginning of the month! Hi LJ! Of course we missed you! :) How's everything? Wow, Genie Princess, you're so busy posting every day now, both here and over at MPG, almost can't keep up with you! Time to wake my little girls for school...see you in the blogosphere! yeah i want to borrow one million also so that i can be millionaire! marzie, that tweet tweet lambat update la...mine baru je update after more than a week! hi jean! busy la jugak haha! I came right over and I have a fresh brewed steaming hot cup of coffee and a yummy little cup cake for you too! lj, trend apa yang tak panjang tu? Hi Emila, Blue,Rizal,Lj,Roxy, hi everyone!! i heard SKII makes us look young, i wanna try but to expensive. monica you look cute in the avatar! rizal is not here, maybe taking a break? yesterday was commenting banyak gila! jackie, thank you for the tag, will put it up soon! Whewwww...I know what you mean about being tired. I should be dropping like mad so my sponsor will get some click through s.
But, I am going to take a wee nap. That is right after I go spin the wheel!! Hey everyone please help me out today. Please drop by and see my first still shot for WW. and please click through for me. I am literally falling asleep at my desk. I will drop around and do the same for you guys after a little nap. will do, jackie! take care! sweet dreams! I'm addicted to PC games to..not the gambling one though. I was once addicted to the Diner Dash..hahahaha..
Be back in a little while...Walt is really nagging me to rest!! Funny thing is that most real casino machines don't use coins anymore, either. 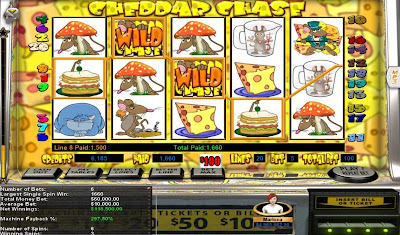 You should check out the Flash games at Pogo for more free slot machines to play. Thank you thank you every one so much!! I just got up a few minutes ago. and wow I almost cried when I saw what you guys did. My oh my Rizal is working hard over here huh? Okie dokie...got to do some clicking and dropping. Also sent ur link to u know who, lemme know how it turns out yeah? Jackie, I've dropped by ur WW post, and left u some comment love as well. aikk marrzie.. tak tidur lagi? that post is a special post - it rules them all - macam LOTR..
your post marzie - only rnr boleh jumpa.. hehe.. i kat rnr - macam mata sauran tuuu keep watching your GP's plain - so kalau ada mariucans yang datang hampir.. dapat laa tau..
mentang2 la rnr dah dapat top untuk hari ni... eksyen betul laa budak nama rizal tuu kan marzie? Morning Marzie! My first post took a long time to be approved too! alamak.. debbie.. you are here.. debbie!! dont you ever sleep? aiyooo debbie.. cicak pun takut yerrr...? yer laa, mula2 rizal pun tak faham tentang no. bila dah terangkan baru faham.. masa mula no. tu jatuh.. agak macam nak give-up jugak..
Budak yg namanya Rizal tu mmg eksyen la..sat lagi Kak Emila mengomen tanpa henti mcm isyarat Astro, baru tau! Hehe..
Rizal, u salu minum kopi brand apa ekk? do i hear somebody say my name.. kat beberapa komen..
kalau cam tu... dgr ni? nanyi lagi femes destiny child..
"say my name... say my name....."
debbie.. pagi ni i tak kat ofis.. sebab nanti kena run tempat lain..
sementara nak run.. ngomen laa dulu..
Bukan takut cicak, tapi benci..org Sarawak cakap gelik! Hehe..
Tu la, Marzie..had to run back to the room and tell him..dahla time2 emergency! Me no likey Mr. L! well, since life is all about balance..
Ish poyo, buat2 tak tau plak dia dah..